Rausch Funeral Home, P.A. is proud to be an independent family owned & operated funeral home. We have served families in the southern Maryland area for more than 35 years. With locations in Lusby, Owings and Port Republic, Maryland, we are a full-service funeral home that is always responsive to the needs of the family’s that we serve, whether pre-planning for the future or after the loss of a loved one. 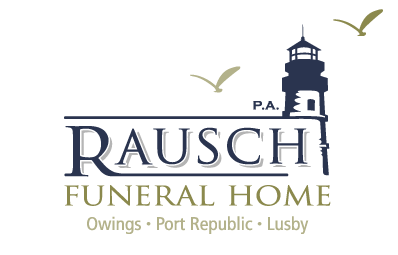 The staff of Rausch Funeral Home strives to uphold our motto: “Where Heritage and Life are Celebrated”. Every family we serve is treated in a dignified and caring manner in planning and performing the service celebrating their loved one’s life. Our licensed, highly skilled, experienced, and helpful staff is available to provide prompt and caring service 24 hours a day, seven days a week, 365 days a year. You may contact us 24 hours a day at 410-326-9400 for our Lusby location, 410-257-6181 for our Owings location, or 410-586-0520 for our Port Republic location. For Frequently Asked Questions, an Arrangement Checklist and What to do When a Death Occurs, please click here to go to our Resources Section.